Ella Jenkins: Still Making Friends With a career that has spanned generations, Jenkins, 86, still loves performing for kids. The legendary singer-songwriter talks about the blues, her early life in Chicago and the children she sings to. 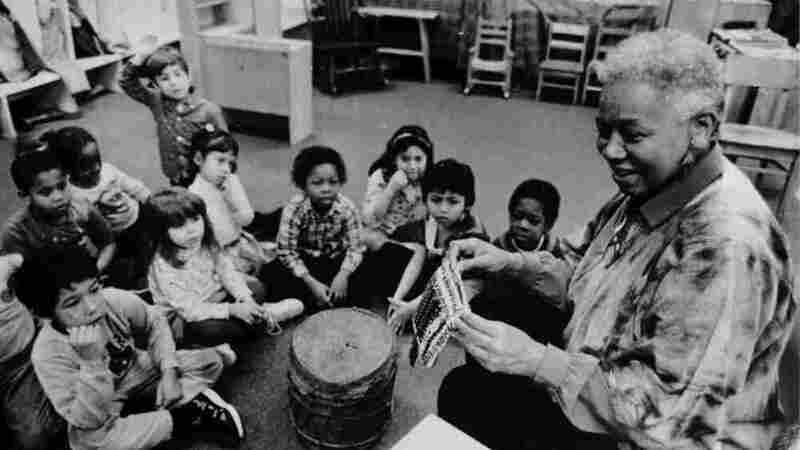 Known as the first lady of children's music, Ella Jenkins has performed on all seven continents. After more than 50 years of singing with children, Ella Jenkins says that every time she's onstage, she still wants to make a friend. "I always tell people who perform for children, don't ever take children for granted," Jenkins tells All Things Considered host Melissa Block. "Rather than just doing the whole show, I get them involved in songs and little chants." That is Jenkins' signature: call and response, full of rhythmic patterns and songs she's collected all over the world, sung in Arabic, Swahili or Hebrew. Jenkins grew up on Chicago's South Side. Her family moved around the city a lot, moving on and, they hoped, up. She never had any formal musical training, but music was all around, starting with the blues — learned at the knee of her Uncle Flood. "He'd come into the dining room and sit down and put on his vest on," Jenkins says, recalling her uncle's daily routine when coming home from work. "He had four pockets and each one held a harmonica. He'd take them and sit down, and I'd sit on the floor and listen to him." Those early days, growing up in Chicago and moving from neighborhood to neighborhood, helped Jenkins develop the sense of rhythm that has made her music memorable. Ella Jenkins plays to a packed hall at The Music Center at Strathmore in 2006. "We jumped rope," Jenkins says. "I never became a master at double dutch, but the people who were good double dutch turners made you very conscious if your rhythm was off. They would tell you very plainly, 'That's wrong.' "
At 86, Jenkins says she's not tired of playing for children, and that the kids who listen to her music make her life much more meaningful. "We learn a great deal from the children — just the handshake, the sincerity, the element of surprise and the thank yous in their voices," Jenkins says. "This makes me thrive more. You know, I just keep going."